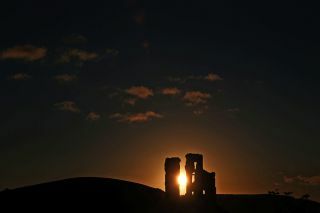 The sun rises behind Corfe Castle in the United Kingdom on the day of the autumn equinox (Sept. 22, 2017). While residents of the northern half of the Earth prepare for shorter days and colder weather — the first day of fall is today (Sept. 22) — there is a sky spectacle to enjoy. Earth's moon and the planet Jupiter will be close together in the sky tonight and tomorrow, shortly after sunset. "Try looking for them as soon as the sky darkens; both the moon and Jupiter are bright and should show up in the twilight," Bruce McClure reported on the astronomy website EarthSky, adding that the sky show began Thursday night. "They might be tough from northerly latitudes on Sept. 21, though. So, near the September equinox — with the autumn angle of the sun and moon's path, the ecliptic, low in the twilight sky — the waxing crescent moon will follow the sun beneath the horizon before it gets good and dark." The beginning of autumn isn't determined by temperature or even by the number of trees changing color. Instead, it has to do with the tilt of the Earth's axis. The planet has two major movements through space: its spin (the planet completes one spin in a little less than 24 hours, which causes the day-night cycle) and its orbit around the sun (which takes about 365.25 days and causes seasonal change). Earth's axis is tilted at 23.4 degrees as the planet circles the sun. Autumn begins when the planet's tilt hits the halfway mark between the longest day of the year (first day of summer) and the shortest day of the year (first day of winter). Technically speaking, the equinox will occur when the sun crosses over the celestial equator — which happens this year at 4:02 p.m. EDT (2002 GMT), Guy Ottewell wrote in an article posted to EarthSky. After sunset on Friday, Sept. 22, 2017, look low in the western sky for Jupiter sitting about 6 degrees to the left of the young crescent moon. The planet's tilt is also why the sun, moon and planets appear to be crossing the horizon at an angle. These celestial bodies move in an imaginary line in the sky called the "ecliptic" that encompasses the movements of the planets, the moon and the sun as seen from Earth's perspective. Very occasionally, two celestial bodies will cross and create an eclipse or occultation. In August, a portion of the United States experienced a total solar eclipse when the moon passed in front of the sun. Right now, the Earth's axis is pointed toward the north star, Polaris, but the gravitational influences of the Earth and sun cause the tilt to slowly change over time. This period of "precession," as the change is called, takes about 26,000 years. This means that Earth's axis points at other stars, or empty space, at different points in the cycle. In roughly 12,000 years, Earth's axis will point at the bright Northern Hemisphere star Vega.